The course focused on developing the skills, constructing the molds, and learning the techniques involved with creating the shape of a goat-horn spoon. 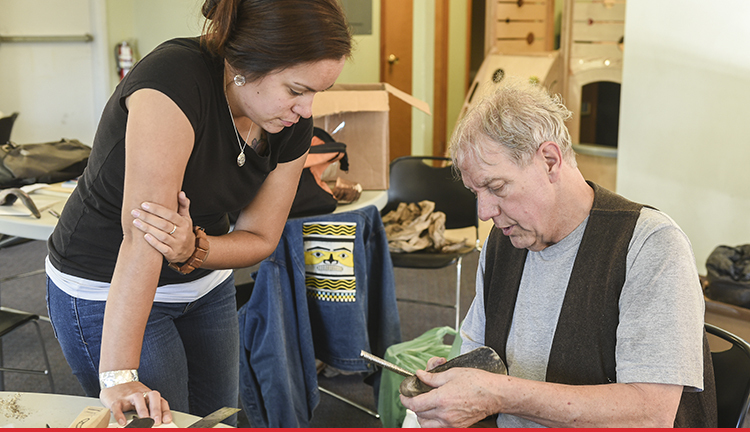 Because of the complexity of the processes involved with creating a traditionally-formed spoon and carved handle, Steve taught only the basics of carving the horn and focused primarily on molding the material into the traditional horn-spoon shape. Also, because of the rarity of goat horns, SHI used horns from bulls and sheep, which are very similar to goat horns. Day 1: Students attending the spoon making class taught by Steve Brown, center, at the Ketchikan Indian Community (KIC), listen as special guest, Nathan Jackson, right, makes some comments. 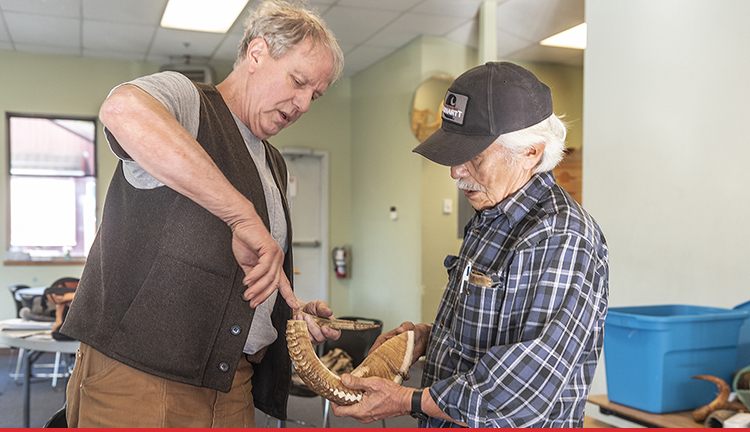 Instructor Steve Brown talks to Nathan Jackson about making a spoon out of a big horn sheep horn. Christian Dalton trims his buffalo horn spoon. Christian Dalton shows a section he removed from a buffalo horn. Steve Brown examines the work of student Trevan Skan, who is making a spoon out of buffalo horn. Jerrod Galanin, left, shows Nathan Jackson the spoon he is working on. Kayla Williams gets some feedback on her spoon from Steve Brown. Steve Brown checks out Brita Alander’s progress on her buffalo horn spoon. 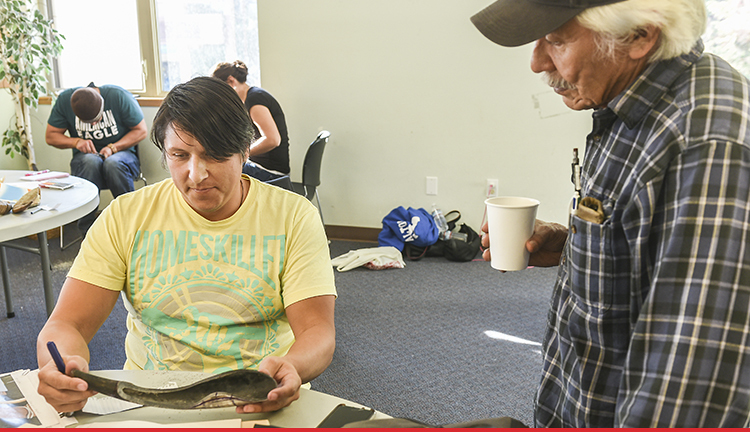 Ketchikan artist/musician Dave Rubin plays with Nathan Jackson during day 3 of the spoon making class. In background, left, Steve Brown helps student Trevan Skan while student Tim Flanery, center, works on his horn. Students posing with the spoons on the last day of the horn spoon class. From left, back row: Christian Dalton, Jerrod Galanin, Tim Flanery, and Trevan Skan. Front row: Kayla Williams, Lisa Dewitt Narino, Brita Alander and instructor Steve Brown. Special thanks to KIC and to photographer Hall Anderson.